Hurts so Good … at Ho Tong Restaurant? A few members of my kin like to go out to eat when we’re too lazy to cook. And to find a good Chinese restaurant is tough. We used to go to Jade Fountain, especially on Mother’s Day, but due to a last minute scramble when relatives from the mainland decided to visit, we ended up going to Ho Tong. This establishment is smaller than Jade, and I wondered if it can even comfortably fit 50 people. Maybe, if the belly of the beast can be stretched. Sadly, the quality of each dish varied from satisfactory to worse. I didn’t think much of the char siu (bbq pork). The spicy crunchy chicken (served with prawn chips) and braised duck were decent, but neither proved to be truly spectacular. The pan-fried noodles were far better, and that was the only dish to disappear into many a family member’s gullet. Even the fried cod in dumpling sauce vanished. On the other side of the spectrum, I found the seafood items less than spectacular. The prawns were mild and the calamari old. When considering the huge amount of food that was offered, neither table (and we occupied two) could finish what was offered. While this place is great with the quantity, the quality was just lacking. To answer the question of whether or not my tummy was feeling the pain afterwards, it did. Both me and my parental unit had a stomach ailment afterwards and it took days for it to pass. And I know I didn’t overeat. I can definitely say that with the lack of liquid, I was feeling dehydrated by the time the group dispersed. During the meal, I looked around someone to refill that complementary pot of tea. The decanter was not visible, and the waiter did not once come to the table to check if our pot needed refilling. Well, the next time the clan has an outing, we need to find a diner that has a scalable product than served by the pound. At least the family members who could not come out received a doggie bag to eat for the next few days! 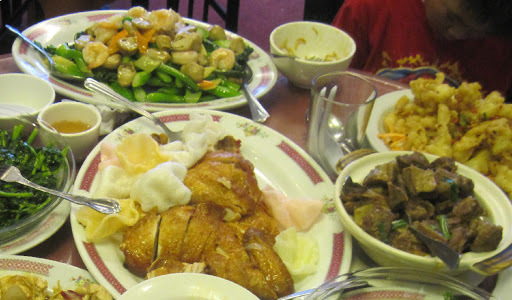 This entry was posted in Food, Reviews and tagged Asian, British Columbia, Chinese, Saanich, Vancouver Island. Bookmark the permalink. ← All You Can Eat at Shiki … everyday?